This is a tea I got as a free sample from Guang nearly a year ago (thanks Guang!). The more than generous amount of tea was marked as 93/94 uncooked sun-dried mao cha from Yi Wu mountains. I brew it few times and I liked it a lot. 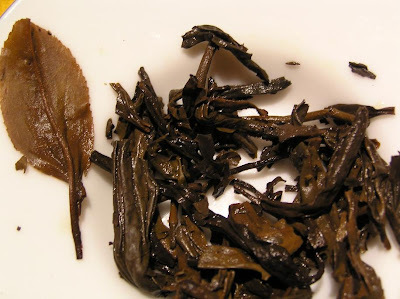 The leaves of this tea are fairly small, mostly brown with few yellowish tips. Unfortunately, as I kept the sample in plastic bag, some of the leaves were probably mangled. Still, they are much smaller than any other mao cha I have. When I brew the tea for the first time, I was really surprised by the color of infusion. 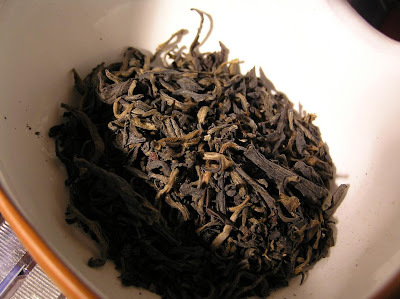 It's dark brown close to the color of some shu pu-erh I had before. Also, the taste was surprisingly shu, earthy, calm and sweet. 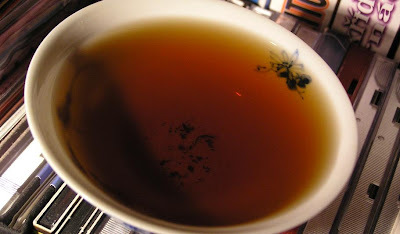 In aged pu-erh, at least in those few I had before, I’m used to find the smell and taste of wet cellar. This may be caused by wet-storage, I’m not sure. One beeng that exhibits in it is the 2001 Mengku Yuan Yieh Xian thick paper version. But not in this one. This tea isn’t shu, either. Instead of the true shu flavors I found the smell of freshly ditched potato. Maybe the tea is semi-cooked, or it's blended by various leaves from various seasons. When I checked the leaves carefully, I noticed, that some where darker, nearly shu-ish while others where green and yellow. This is similar to 8972 Menghai brick sold by Guang, too. While the true origin of the tea remains a mystery to me, I like it. Only few grams of the sample remain, so I have chance to explore and enjoy it only once or twice.